The National Institute on Retirement Security wants to set the record straight about the positive impacts defined benefit pension plans have on public and higher education. According to the NIRS report Win-Win: Pensions Efficiently Serve American Schools and Teachers, that isn’t true. Defined benefit plans help employers recruit and retain committed teachers so that schools benefit from educators’ increasing effectiveness, Oakley says. They do that by offering larger benefits later in a teacher’s career as an incentive for good teachers to stay in their jobs. The pensions also better address obstacles to retirement income security by covering a majority of employees with adequate savings and managing the risk associated with retirement. The public also “overwhelmingly supports DB pensions for teachers and acknowledges their retention effects,” she says. He adds that pensions create meaningful incentives for people who take jobs in schools and stay on the job for long periods of time by deferring their compensation into the future. “The longer you stay, the more you are going to get. People do react to that kind of incentive and that has a number of benefits for the employer,” Weller says. The biggest is that teachers tend to get more effective with experience. The other benefit is that defined benefit plans “aren’t moving up and down with the market and employers can manage their workforce more predictably,” Weller says. Teachers who have access to defined benefit plans stay on the job longer, Weller says. There is higher turnover with defined contribution plans, which can cost schools more money because they need to spend time and money hiring someone new and then training them. State and local budgets tend to fluctuate constantly so “knowing what is happening with teacher salaries makes budgeting a lot more predictable in the way they need balanced budgets,” he says. 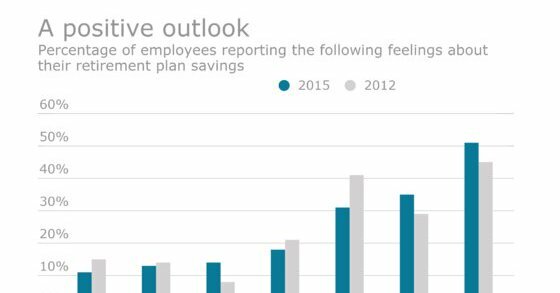 Defined benefit plans also allow teachers to retire at a more predictable age, which helps the employer do a better job of managing turnover. But, Weller says, there is nothing in a pension that says you have to retire at age 62. Defined benefit plans put the long-term financial risk on the employer because “it can manage these financial risks more efficiently, which is a real savings to teachers and a real savings passed on in terms of higher benefits and higher lifetime income,” Weller says. He points out that only 51.3% of private-sector workers had access to a retirement savings plan through their employer but 82.4% of public workers were offered a plan. Defined contribution plans are now trying to duplicate the auto enrollment feature that has always been a part of defined benefit plans, but it isn’t automatic at this point. Employers have to make the decision to offer automatic enrollment. In the public sector, employers and employees make median contributions of 6% to 8% of pay to retirement savings, while in the private sector, that median combined contribution rate is about 6%, he says. Pension plans also have to plan for the average life expectancy but with defined contribution plans, “you have to plan for the possibility you are going to live to 105,” Weller says. Teachers who have a pension plan know their retirement income security is high. “You don’t have to live on cat food. You don’t have to struggle in retirement. That peace of mind means that teachers and others can take a longer view of their future. They can take it easy,” Weller adds.